Combo Moving Packs offer you the choice between 15 medium size and 9 large size deluxe boxes. Mirror Boxes help secure your glass and mirrors from breakage; made from 200#/ECT-32 kraft corrugated. Wardrobe Boxes make it easy to move or store your closet; made from 275# ECT-48 corrugated carton. 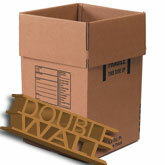 Dish Pack Boxes and partitions help secure your valuables; made from 350# double wall corrugated carton. Find exactly what you are looking for with our easy to use filter below. 1|2|33+3%2F4%22|4+1%2F16%22|6%22|18%22|20%22|40%224%22|18%22|24%22|30%22|37%22|37+5%2F16%223+1%2F2%22|4%22|28%22|30+3%2F4%22|31%22|46%22 Select a Category123 Width3 3/4"4 1/16"6"18"20"40" Length4"18"24"30"37"37 5/16" Bottom Gusset3 1/2"4"28"30 3/4"31"46"
1 - 3/16" x 12 x 175' BUBBLE DESP. 1 - 3/16" x 12 x 175'BUBBLE DISP.